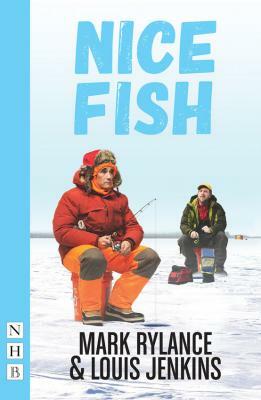 Nice Fish (Paperback) | The Drama Book Shop, Inc.
On a frozen Minnesota lake, the ice is beginning to creak and groan. It's the end of the fishing season and on the frostbitten, unforgiving landscape, two friends are out on the ice, angling for something big, something down there that, had it the wherewithal, could swallow them whole. With the existentialism of a Beckett two-hander but set in the icy and folksy depths of the Midwest, Nice Fish is a unique portrayal of a friendship forged out of boredom, bad jokes, and an ability to wait for a really nice fish. Nice Fish premiered at the American Repertory Theater in Cambridge Massachusetts, directed by Claire van Kampen, and played to rave reviews in a sold-out extended run in New York in February 2016 at St. Ann's Warehouse, starring Mark Rylance and Jim Lichtscheidl, and featuring Louis Jenkins. The play transferred to London for a run in the West End at the Harold Pinter Theatre, beginning in November 2016. Publisher: Nick Hern Books, Ltd.